The launch of the Manchester Science Festival programme today risks being overshadowed by the revelation that three of its partners walked away from their involvement, and others raised concerns, after being informed that the event’s headline exhibition would be sponsored by Shell. The Manchester-based Science and Industry Museum (SIM)’s new exhibition – ‘Electricity: the spark of life’ – will open to coincide with the start of the festival on the 18th October, but news that Shell would be its major sponsor has sparked a growing controversy since it was announced. The news come as Manchester residents are to submit a petition to the museum at 11am today calling for the sponsorship deal to be dropped, after it gained 57k signatures on the 38 Degrees website. You can view the emails by clicking here. ‘We are an organisation working towards a sustainable future. Shell is a company wedded to the oil age, with a vested interest in maintaining the status quo. We feel it’s vitally important that our cultural and educational institutions remain independent from these voices. Since Shell’s sponsorship of the new exhibition was quietly announced on the 7th August, others have also called on the museum to end the deal. Seventy scientists, artists, campaigners, politicians, local organisations and representatives of communities affected by Shell’s activities – including naturalist Chris Packham, Manchester-based climate scientist Kevin Anderson, President of Greater Manchester Association of Trade Union Councils Stephen Hall, and environmentalist Sir Jonathon Porritt – signed an open letter to the museum’s director Sally MacDonald calling on her to think again. The announcement of Shell’s sponsorship of the Science and Industry Museum came just weeks after the Greater Manchester region experienced large wildfires as part of a nationwide heatwave, prompting renewed debate about those that are driving climate change. Over the last week it has been confirmed that three Dutch museums – including the Van Gogh Museum in Amsterdam – are ending their sponsorship deals with Shell, following a campaign of creative protest by the group Fossil Free Culture NL. 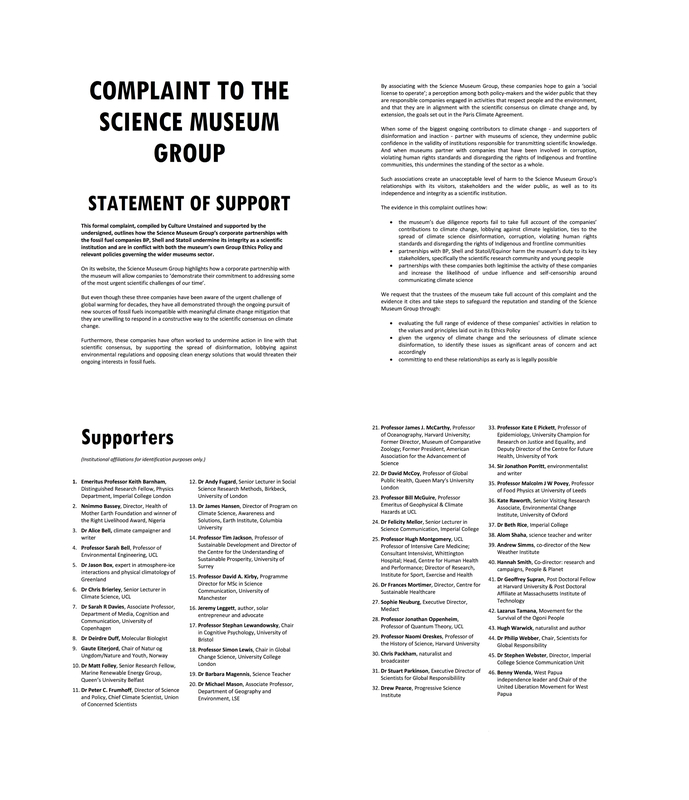 The Science Museum Group – of which the Science and Industry Museum is a member – is already under pressure to justify its partnerships with Shell, BP and Equinor after nearly 50 leading scientists submitted a formal complaint in July arguing that the museum group is ‘undermining its integrity as a scientific institution’ by partnering with major fossil fuel companies, despite their continued contribution to climate change. You can view the full text of the formal complaint by clicking here. Over the last year, campaigns calling for ethical funding of arts, science and cultural institutions are becoming more widespread. At the beginning of August, around 40 artists with objects on display in the Design Museum’s ‘Hope to Nope’ exhibition removed their artworks from display after discovering the museum had allowed its building to be hired for an arms industry reception event. And in March, BAE Systems was forced to withdraw its sponsorship of the Great Exhibition of the North just a week after it was announced when large numbers of participating artists refused to have their performances associated with the arms company.